I have always thought about investing in a home security system, but most of the solutions I have been looking at are too expensive or too robust for my needs. I want a solution that allows me to monitor my home from anywhere and record video to an offsite location in case someone got the bug to take my stuff instead of buying their own. D-Link thinks they have a solution. Enter the DCS-1130 Wireless N Network Camera. Some of the things that set the DCS-1130 apart from a standard web cam is that the unit actually contains its own CPU and web server. This means that the wireless camera is a standalone unit that can be mounted anywhere you have an electrical outlet in your home; and because the DCS-1130 is a wireless unit (Wireless 802.11n and 802.11g) you don’t have to worry about having a PC nearby. The camera also supports using a wired Ethernet (10/100 Fast Ethernet) connection in case wireless isn’t available to you. If you are looking at the hardware behind the DCS-1130 you are looking at a camera with a 1/4″ CMOS sensor, a 5.01 mm lens, a built in omni-directional microphone with a frequency range of 50 ~ 16000Hz, and capable of 16x digital zoom. The unit weighs in at about a half of a pound and measures 1.5 inches x 3.2 inches x 4.7 inches. The small size of the DCS-1130 allows you to mount it nearly anywhere using the included camera base and mounting kit and the white color gives a bit of camouflage when mounting from your ceiling. Typically, with standard web cams, you are limited to low resolutions tied to higher frame rates and the higher resolutions tied to the lower frame rates. The DCS-1130 allows you to stream and capture MPEG-4 and MJPEG video at 30 frames per second at 160×120, 320×240, and 640×480. The images and video captured from the DCS-1130 are adjustable between the variable resolutions and feature a time and date stamp along with the Camera Name. The camera can be set for four simultaneous profiles allowing you to adjust image size and quality for different applications such as web streaming or recording video. We caught our cat wondering what that new thing on the wall was. The live video tab displays a live view of your camera and will allow you to switch between the various profiles you may have created for your camera. You are also able to save a snapshot of the video as a JPG, download video, set the current storage folder, and turn the sound on or off. The setup tab contains exactly what you would expect to find here. You have the ability to create your profiles, set the date and time, configured recording, motion detection, wireless settings, dynamic DNS, image setup, and more. The maintenance tab gives you the ability to update the firmware, download / upload the configuration files, add and manage users, rename the camera to a friendly name like Living Room instead of DCS-1130, and turn of the front power LED to make the camera a little less noticeable. The status tab will let you see the camera’s log and give you some descriptive information about the unit. The administration behind the DCS-1130 makes for a user friendly experience. There are wizards for everything should you decide you need to use them and for those of us that hate them, the ability to configure it all manually. D-Link designed the administration interface to replicate what you would find in many of their other products, it features the same colors and the same general layout making this a familiar experience. 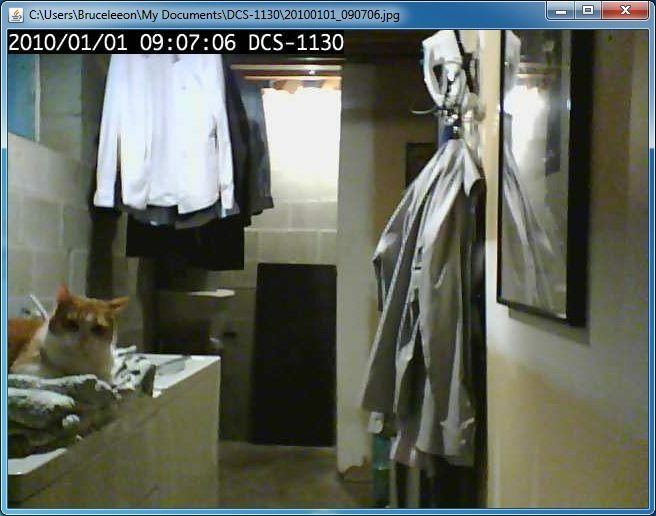 The ability to configure the camera to only record when motion is detected is a huge bonus. I don’t want to have to dig through tons of video footage to find one moment in time. The motion detection behind the DCS-1130 can be configured to activate recording at a threshold or monitor a specific area of a captured region. An example of this would be having the camera pointing at your front door and configuring motion capture to only monitor the door instead of everything around it. The threshold allows you to also take into consideration that you may not want to record every time your cat walks by (I learned the hard way). The image quality and sound quality far exceed what you would expect to get by spending about $119.00 USD and it is better than some systems costing more than double the price. 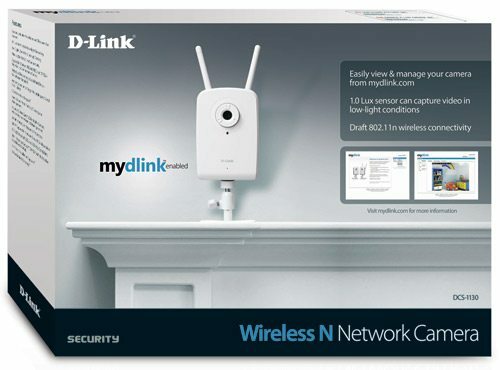 When you add in the ability to configure the camera for D-Link’s free mydlink.com website you have a versatile surveillance system that is inexpensive and very capable. If you are managing more than one camera, D-Link offers a software package that mimics the front end of many packaged surveillance systems. You also can’t forget the free iOS and Android applications that allow you to view your camera’s video stream from your mobile device. When you package all these things together, you end up with a top notch value that competes well and even wins over systems costing much more. Bottom line… would I buy one? No, I bought 3.